It was quite an honor to host all the teams who participated in the Winter Classic this year! Kempter Family Dentistry sponsored an action packed tournament, and we would like to thank them for all their support! For those of you who made it to the game and had a chance to flip through our program, you were able to see the support from the community that made it possible for The TarWheels to put on such an event. Great games were played by all, and congratulations to the 2013 Winter Classic winner, the Celtics! Support at the event from our sponsors, as well as fans and teams attending helped in funding this years tournament and The TarWheels Organization. Attendance was up and even drew in some attention from WSOCTV, our local news! Thanks to all of our volunteers who helped in many ways, especially Mt. Pleasant High Schools Interact Club and Mrs. Love for getting all the volunteers together for us! The support given from the community shows us that there is a strong belief in what our organization helps to accomplish! For your sponsorship of this event, thank you to: Kempter Family Dentistry, Iron Thunder Saloon, Quaker Steak and Lube, Bailey Jane Photography, BRE Motorsports, Wingate by Wyndham (Concord), Boardwalk Billy's Raw Bar & Ribs, Ramco, Carolina Mobility Sales - LLC, Clint Miller Exterminating, Broome Signs Company, RK Entertainment, East Side Motors - LLC, Ottinger Heating and Air Conditioning, Primetime Sports Apparel, TLC Group - LLC, The Cabarrus Visitor's Bureau, Overdrive Transmissions, Grammy's Attic, A&M Printing, Food Lion, Sandy, Harris Teeter, Cornwell Tools, and Janet Langford! Seven teams traveled 3,515 total miles to attend this year's tournament with the TarWheels! That is truly an honor in itself! These great distances lead to games played between teams that might otherwise only see each other at the national tournament. The great battles and some of the upsets will surely weigh on the next set of national rankings that are due out in February. 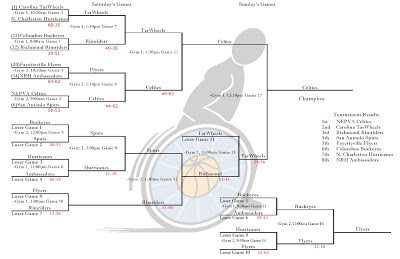 A look at the final bracket below shows just how many games were played and the level of competition present. We hope to have many of the same teams back out next year for the 4th installment of the Winter Classic, as well as many more! As mentioned, the NEPVA Celtics took home the championship trophy, but congrats are in order for all the teams. 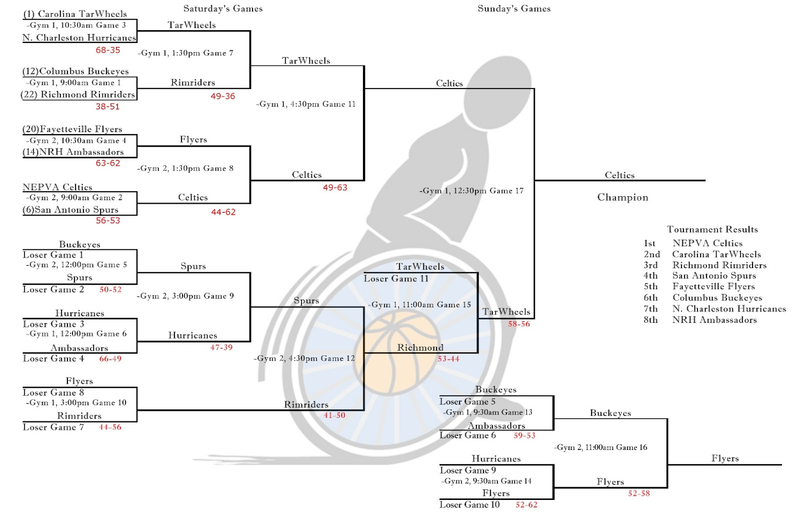 The TarWheels were runner up, followed by Richmond Rimriders, San Antonio Spurs finished 4th, next were The Fayetteville Flyers, Columbus Buckeyes, The North Charleston Hurricanes, and finally the NRH Ambassadors. Trophies were also given to players selected to the "All Tournament Team." This is a group of players voted on by each team present in the tournament. Those receiving the top votes for an individual's classification are awarded this trophy (To learn more about how player's are classified, click here). The TarWheels will be on the road this weekend, headed to North Charleston to compete in four conference games, all against The Hurricanes. Make sure to check on our "Next" tab if you are in the Charleston area and would like information regarding location. The TarWheels' schedule is winding down, we look forward to seeing many new and familiar faces at our remaining home games! Donations make possible the continued growth of the TarWheels Organization, thank you for your support!